SAVE YOUR TREES-NO INJECTING- NO DRILLING JUST SPRAY THE TREE BARK!!!! and other plants like oak trees, pines, all trees with agrifos mixed with pentrabark . The agrifos pentrabark mixture should be sprayed on the lower 8 feet of the tree and then soaks into the sapstream of the tree automatically. This product stimulates the tree to begin the process of producing new roots, leaves and regenerating tissue damaged by environmental stresses of all kinds. Product is labeled for sudden oak death, beech decline, pine pitch canker, collar rot, apple scab, root rot and other tree ailments. Very low toxicity and environmentally friendly product. You get 1-2.5 gallon agrifos and 1 quart of pentrabark. 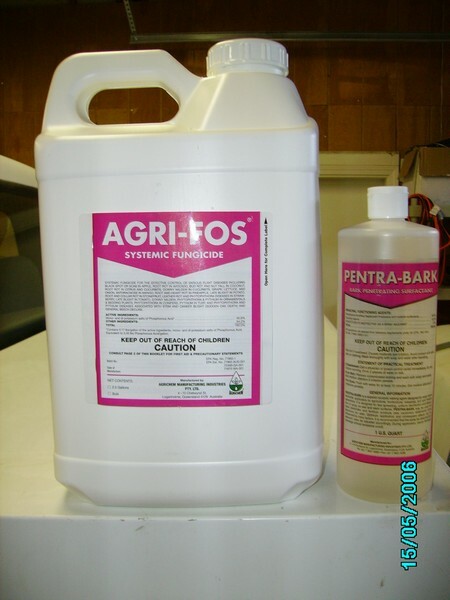 Or you can now order 2x2.5gal with 1 qt pentrabark or NEW: 1gal agrifos + 1qt Pentrabark.Mix 1 gallon water with 1 gallon agrifos with 2fl oz pentrabark and mix well in standard backpack sprayer. Should treat about 15-20 average size trees. Caution: Avoid getting mixture on foliage it will burn it!!! - only spray bark of tree!!!! Repeat this treatment often for best results. This is the size container the professionals use, save money on this size versus quarts and pints. NEW SIZE 1 GALLON CONTAINERS TREATS ABOUT 6 AVERAGE SIZE TREES.